What would your life be like if you increased your productivity, increased your job satisfaction and increased your influence over those you lead? Your leadership skills impact many people besides you: your team, your Customers, your colleagues and your boss to name a few. When you intentionally focus on your using your leadership strengths AND work to improve your leadership challenges you will dramatically increase your productivity, increase your job satisfaction and increase your influence on those you lead. That’s the secret … you have to KNOW what your strengths are and KNOW what challenges you are trying to improve. In what areas are you really succeeding as a leader? In what areas do you need the most improvement? Really … how do you know? The most successful leaders you know can articulate their specific strengths and challenges with absolute certainty because they know the only way to become more productive, more satisfied and more effective is to enhance their best skills and find ways to improve those areas that are most challenging. You can be absolutely certain too! The Remarkable Leadership 360 Assessment can help you with all those things and more. That makes perfect sense; and you’re wise to be skeptical. Before you make any decisions about your Remarkable future we would expect you to explore the pages within this website. Learn more about Kevin. See what other people say about us. Get answers to some regularly asked questions. With the Remarkable Leadership 360 Assessment we are focused completely on you and your success. So, once you are convinced we’re for real, we look forward to working with you to help you set yourself up for unprecedented success. 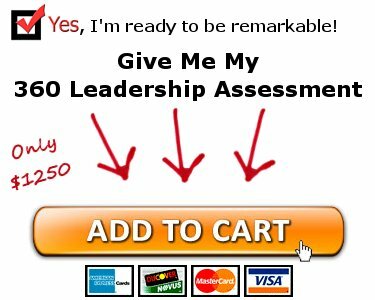 What is the Remarkable Leadership 360 Assessment? An online assessment tool designed to gather feedback on your leadership performance from “360 degrees” around you. You’ll receive anonymous feedback from your boss, peers, team and others. You’ll also rate your own performance. A customized report and personal consultation based on the feedback from the assessment. You’ll receive a custom, written report compiling all the feedback – plus have a conversation with a personal coach to help you work through the report details. A personalized action plan created based on your feedback to help you strengthen your strengths and improve your challenging areas. One-on-one coaching to help you implement your action plan. With feedback from a variety of sources on these key areas, you will truly understand your current performance and have ideas on the best ways to continue on your path towards remarkable results as a leader! What’s Included in My Assessment? Administrative support to make the process easy and painless – we take care of all the administrative steps for you. A customized report of your feedback results delivered only to you and your coach. A personal consultation with one of Kevin’s personally trained coaches to help you understand your results and what they mean for you. One-on-one coaching – with that same coach – to work through the personal action plan you create based on your feedback. Up to 3 learning resources from the Remarkable Leadership Learning System to provide specific tips, tools and techniques on the skills you need most. Plus, every piece of this process is designed to help you understand and capitalize on your strengths while recognizing and strengthening your leadership weaknesses. We are here to help you create more remarkable results. No other Leadership 360 Assessment process provides this complete set of services! When you choose to be personally responsible for your remarkable leadership future through a Remarkable Leadership 360 Assessment you are investing in more than just a 360 Leadership Assessment. You’re also investing in the power of the Remarkable Leadership Learning System team to help you become the leader you were born to be. Your investment for the complete package of services and outcomes listed above is just $1250. When you consider you’ll be working from a personal plan of action based completely on your personal strengths and challenges, you can see how this investment will be quickly and easily repaid! This is an absolute no-risk opportunity. We believe in you, we believe in the power of intentional learning, and we believe in the value of 360 Assessments. However, if for any reason you are not completely satisfied with the Remarkable Leadership 360 Assessment just let us know and we will immediately refund your money. What would even modest increases in productivity, influence and satisfaction mean to you? What if you could create remarkable increases in productivity, influence and satisfaction? You have the power – right now – to make a transformational change in your leadership future. You have everything to gain and only your remarkable future to lose. You can exponentially broaden the power of the Remarkable Leadership 360 Assessment by bringing this custom tool and opportunity to your entire organization. Contact us today for organizational discounts and additional information about system-wide implementation.